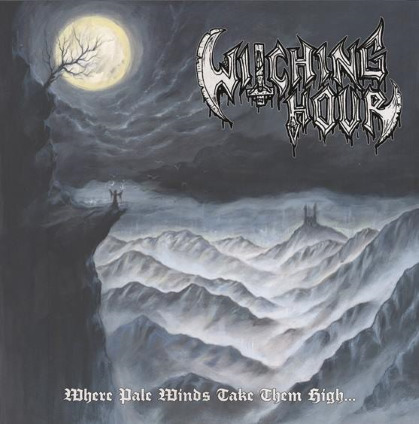 Where Pale Winds Take Them High, is the third full-length by the German band Witching Hour. This Black/Thrash metal album primes for fast-paced catchy riffs. There is a certain hint of Power Metal in the epic construction of the songs; the melodies sound almost folkish, and the guitar duets would not be out of place in an Angra album. In contrast, the blasting drums and loud, rough, highly-reverbed vocals spill mad Thrash all over the place. Nevertheless, the parts work very well together in a chaotic yet melodious album. From the choice of tones to the guitar duets, everything indicates that Witching Hour was looking for the elusive “Old School” sound. They succeeded. Although the album presents very original works, it brings me back memories of being in High School and listening to the bands my heroes listened to. The Album seems to alternate between faster and more atmospheric tracks, as to keep the momentum of the pale winds. Where Pale Winds Take Them High/ About A Curse Of, the first piece, states the overall idea of the album with strong dragging riffs and explosive drums. So I’ve Chosen Death is fast, aggressive, and full of guitar duets. From The Black Crypts Of Fullmoon, and Long Way Off...In Silent Nights, in their turns, expand some of the ideas introduced in the opening track. Finally Von Unaussprechlichen, the closing track, is a hypnotizing Viking-style instrumental piece that carries some of the band’s best Black Metal moments. Witching Hour has definitely come out with a mature and interesting work. Its pieces lead you to an epic journey through dark places, to the dramatic closure. I hope to review more of their works in the future.